I remember the first time I plucked then greedily devoured my first garden-grown strawberry. Aside from inwardly beaming with pride at the fact I'd managed to nurture my fulsome plants to delicious fruition, I was knocked back by the fill-the-mouth taste packed by these beauties. The sweet succulence was joined by an almost intoxicating aroma that filled my palate and travelled up and into my nasal passage. I was hooked – I had attained gardener's nirvana! Set plants into multipurpose compost, spacing them 25-30cm (10-12in) apart – this is closer than they would be in the ground as it will be easier to water and feed them. Bare-root runners can look quite severe with their minimal top growth and often less-than-plump roots. This is normal, so worry not! 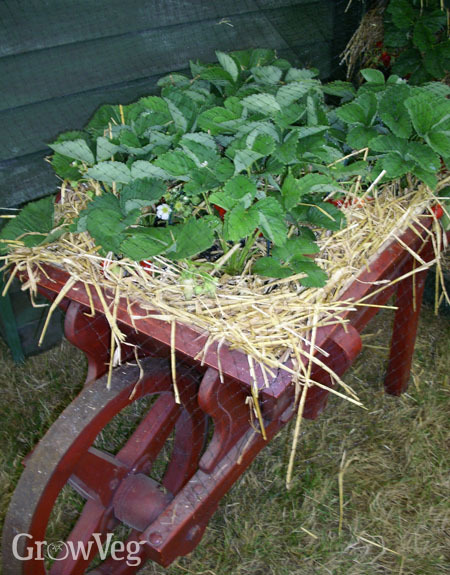 Give the runners a soak in a bucket of water to revive them or water pots of strawberries if they are at all dry.